Why just have a bounce house when you can Hook the hose up to the slide and let riders enjoy a super splashing water slide that drops them into the splash pool at the bottom. Jumping, bouncing, climbing and sliding, splishing and splashing fun guaranteed. The Rhino Classic Rainbow Bounce House and Water Slide Wet/Dry Combo Adventure is the perfect addition to any backyard celebration. to keep the bouncing fun going for hours! Book Early as we have a very limited number of combo Bouncer with Water Slides. 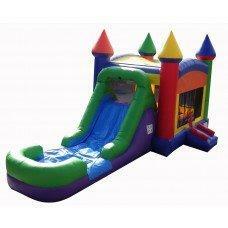 Inflataded dimensions 30' (L) x 14' (W) x 14' (H) - - Bounce Area is: 14' X 12' X 14"